Mozilla&s latest version (#65) of the popular open source browser Firefox includes support for Google&s efficient WebP image format, improved tracking protection, and support for the new open source AV1 video codec. The AV1 codec of the Alliance for Open Media, which includes influential companies like Amazon, Apple, ARM, Cisco, Facebook, Google, IBM, Intel, Microsoft, Mozilla, Netflix and Nvidia, is about 40% more effective than the HEVC/H.265 codec and twice as good as AVC/H.264. It is supported by Google&s Chrome, Opera and now also the Firefox browser (Firefox version 65 is available since a few days - existing installations are updated automatically). 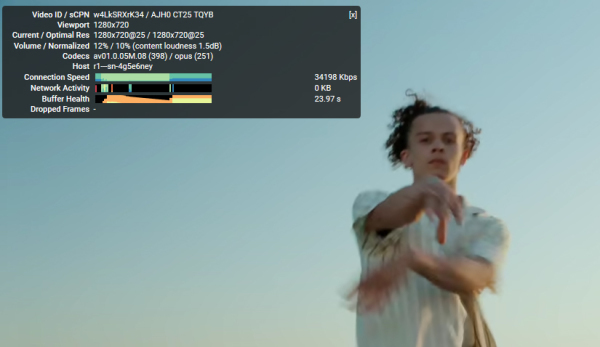 For streaming portals like YouTube, the growing support for AV1 is hopeful, as it will save both license fees for the use of AVC/H.264 and HEVC/H.265 in the future and (due to the higher efficiency) bandwidth in the transmission of the videos. Another saving is the use of the WebP image format, which consumes about a third less data than JPEG or PNG images while maintaining the same quality. WebP has already been used as an alternative on many sites on the net, as it has been supported for some time by Google Chrome Browser, which has a worldwide market share of over 70% and is therefore by far the most important browser, and the smaller image sizes shorten the loading times of web pages. Whether the AV1 codec is used can be determined by selecting a video at YouTubes AV1 playlist and then right-clicking on the video to select "Statistics for Nerds": there you can see the resolution and bitrate of the video as well as the codec used - in this case "AV01". Another practical innovation in Firefox is the Task Manager (to be found under "Other"), which displays all active tabs including the respective processor load and RAM usage - so you can now easily locate web pages that block the browser or create a lot of load or consume memory.